Sircar Anirbid, Sahajpal Shreya and Modi, Umang, 2016, City Gas Distribution: Indian Perspective, Technology Publishers, ISBN: 81-901767-4-9 Pages:233. Sircar Anirbid and Yadav Kriti, 2017, Harnessing of Geothermal Energy: Applications in India, Technology Publishers , ISBN:81-901767-5-7,Pages:184. 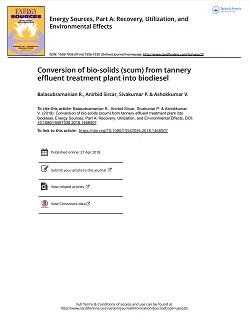 Balasubramanian, R., Sircar Anirbid and Sivakumar, Pandian, 2018, Synthesis and Characterization of Surface Functionalized Maghemite Nano Particle for Biofuel Applications, Chapter 23, Nanotechnology for Energy and Water, Springer International Publishing AG, DOI 10.1007/978-3-319-63085-4_23; Book ISBN: 978-3-319-63084-7. Sircar, Anirbid, Chandra, Shishir and Shah, Manan, 2018, Utilization of Geo-Solar Hybrid system for Efficient Power production in India, Chapter 28, Nanotechnology for Energy and Water, Springer International Publishing AG, DOI 10.1007/978-3-319-63085-4_28; Book ISBN: 978-3-319-63084-7. 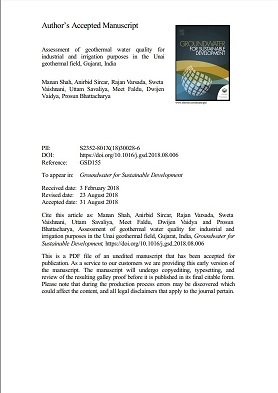 Shah, Manan, Vaidya, Dwijen, Dhale, Shubra, Sircar, Anirbid, Sahajpal, Shreya, Yadav, Kriti, Exploitation of Oilfield Geothermal Resource in INDIA, Chapter 7, Nanotechnology for Energy and Water, Springer International Publishing AG, DOI 10.1007/978-3-319-63085-4_7; Book ISBN: 978-3-319-63084-7. 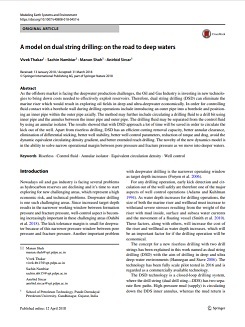 Vaishali Sharma and Anirbid Sircar, Special Technical Report - ‘’PDPU, DGH and Oil & Gas Industry Experts discuss issues related to Exploration of Hydrocarbons in Unconventional Shale Reservoir’’, Dew Journal, Volume 26, No. 02, ISSN 0971-7242. 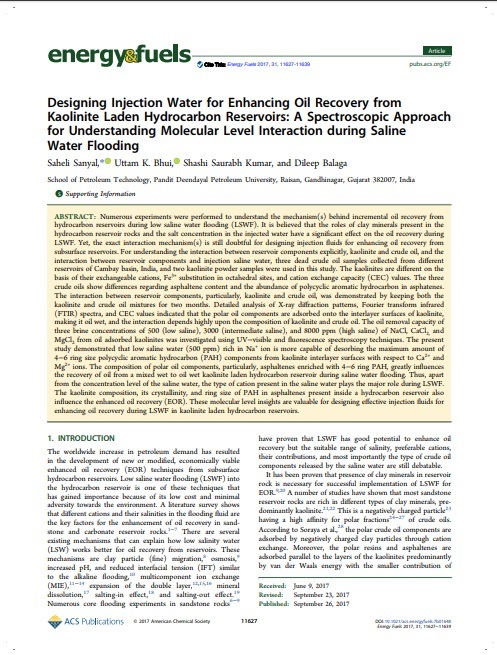 Vaishali Sharma and Anirbid Sircar, Special Technical Report – Enhancing Oil and Gas Production in Cambay Basin, Dew Journal, ISSN 0971-7242. Media Coverage of Workshops (Jointly with Vaishali Sharma, Anirbid Sircar and Infraline Energy). International Shale Gas and Oil Workshop Proceedings, Infraline Comprehensive Power, Oil & Gas & Coal Only Detailed Newsletter, Infraline Energy Coverage. Newsletter, Event Focus: International Shale Gas and Oil Workshop -2016, Infraline Plus, Infraline Energy, Volume 5, Issue 8, December 2016. Anirbid Sircar, Epathsala Paper-Sedimentary and Petroleum Geology-Application of Radiogenic and Stable Isotopes in reconstruction of Paleoenviroments, SED& PG VI, 2017. Anirbid Sircar, Epathsala Paper-Sedimentary and Petroleum Plate Tectonics and Global Distribution of Hydrocarbon Reserves, SED& PG VI, 2017. Anirbid Sircar, Epathsala Paper-Classifications of Indian basins and petroleum geology of Assam, Cauvery and Bengal Basins, SED& PG VI, 2017. Vaishali Sharma., Anirbid Sircar and M. Arif., International Shale Gas and Oil Workshop: Key Issues related to Shale Gas Exploration, Production and Policy Formulation, Infraline Comprehensive Power, Oil & Gas & Coal Only Detailed Newsletter, Infraline Energy Coverage. Pneumatically Operated Mechanical Bit using a Rotary Steerable System: provisionally accepted. Indian Patent by Deep Joshi, Bhagya Bhardawaj and Harshil Saradva. Papers Published In Peer Reviewed National and International Journals. 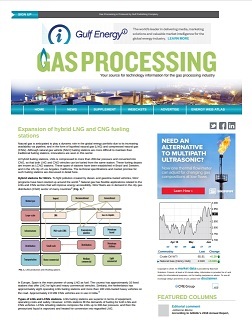 Yadav, K., and Sircar, A., 2018, Hybrid LNG and L CNG stations, Accepted in Gas Processing, Gulf Publishers. 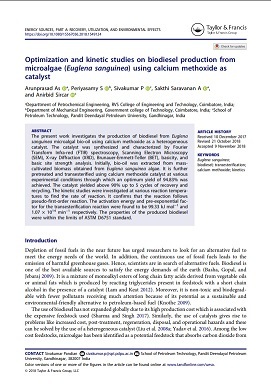 Sivakumar, P., Sircar, Anirbid, Deka Barsha, Anumegalai, A.S., Moorthi, P.S., Yasvanthrajan, 2018, Flow improvers for assured flow of crude oil in midstream pipeline –A review, Journal of petroleum Science and Engineering, Elsevier, https://doi.org/10.1016/j.petrol.2018.01.022 (Online: 10th Jan, 2018) (Impact Factor: 1.873). Talukdar, M., Sanyal, S. And Sengupta, P. 2017. 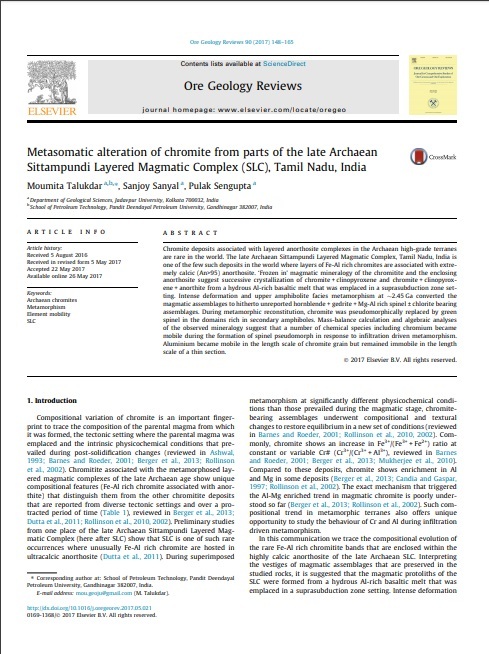 Metasomatic alteration of chromite from parts of the Late Archaean Sittampundi Layered Magmatic Complex (SLC), Tamil Nadu, India. Ore Geology Reviews, 90, 148-165. (Impact factor: 3.095), Elsevier publications. 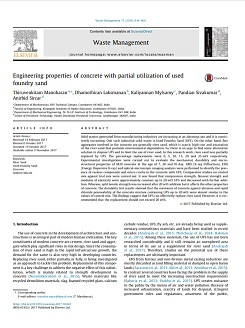 Manoharan, T.; Laksmanan, D. ; Mylsamy, K. ; Sivakumar, P. ; Sircar, Anirbid, 2017, Engineering Properties of Concrete with Partial Utilization of Used Foundry Sand, Waste Management, Elsevier, Feb, 2017, doi.org/10.1016/j.wasman.2017.10.022 , Elsevier, (Impact Factor: 4.03). Available Online : 2nd Nov, 2017. 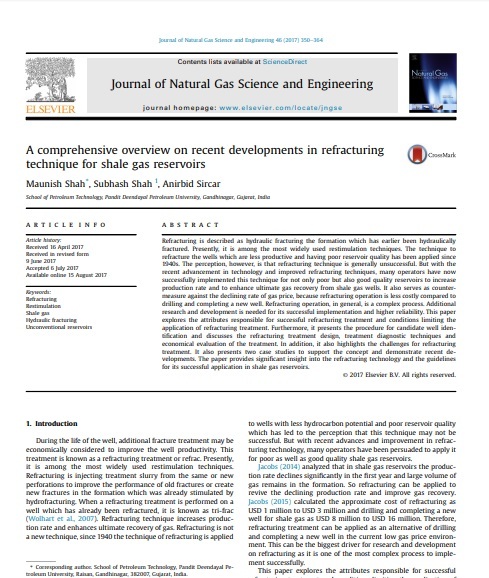 Shah, M., Shah, S. and Sircar, A., 2017, “A Comprehensive Overview on Recent Developments in Refracturing Technique for Shale Gas Reservoirs” Published online in Journal of Natural Gas Science and Engineering, October 2017 46:350-364 Elsevier. (Impact Factor:2.718). 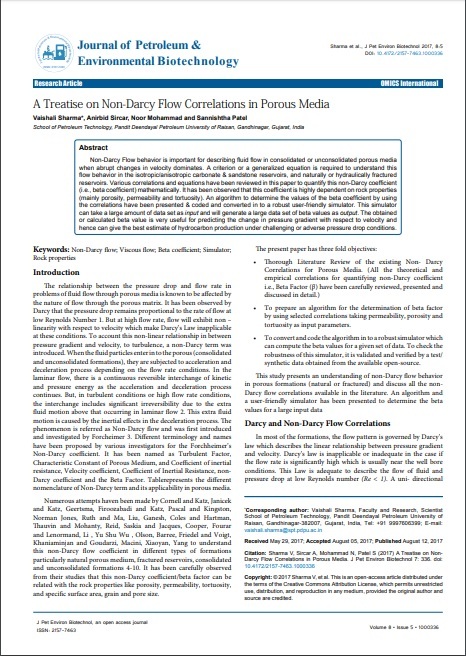 Sharma, V., Sircar, A., Mohammed, N. and Patel, S., 2017, A treatise on Non-Darcy flow correlations in Porous Media, Journal of Petroleum and Environmental Biotechnology, Vol. 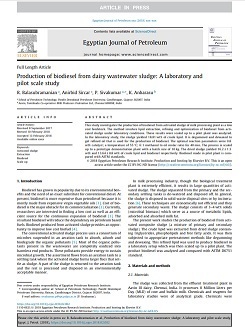 8, No.5, DOI: 10.4172/2157-7463.1000336. (Impact Factor:2.5). Sircar, A., Sahajpal, S. and Yadav, K., 2017, Challenges and issues in natural gas distribution Industry, Journal of Petroleum Engineering and Technology, Vol.7, Issue2, pp. 1-8. Sircar, A., Shah, M. and Chandra S., Utilization Of GeoSolar Hybrid System For Efficient Power Production (2017), International Conference on Nano for Energy and Water (NEW) & Indo-French Workshop on Water Networking, February, 2017, University of Petroleum and Energy Studies Dehradun, India, ISBN: 978-81-928068-4-6, pp. 1-109. Shah, M., Vaidya, D., Dhale, S., Sircar, A., Sahajpal, S., and Yadav, K., Exploitation and Utilization of Oilfield Geothermal Resources in INDIA, (2017), International Conference on Nano for Energy and Water (NEW) & Indo-French Workshop on Water Networking, February, 2017, University of Petroleum and Energy Studies Dehradun, India, ISBN: 978-81-928068-4-6, pp. 1-109. 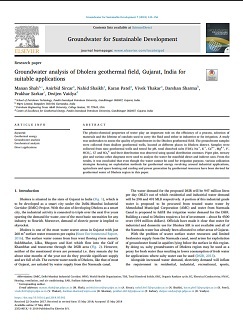 Shah, M., Sircar, A., Sahajpal, S., Sarkar, S., Sharma, D., Garg, S., Mishra, T. and Shukla, Y., 2017, Geochemical Analysis for Understanding Prospectivity of Low Enthalpy Geothermal Reservoirs of Dholera, February, 2017, 42nd Geothermal Workshop, Stanford University, pp. 1-16. Shah, M., Vaidya, D., Sircar, A. and Sahajpal, S., Utilization of Abandoned Coal Mines as a Low Enthalpy Geothermal Resource and Subsequent Energy Exploitation, February, 2017, 42nd Geothermal Workshop, Stanford University, pp. 1-6. 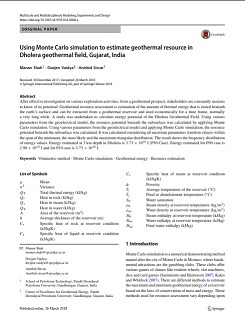 Vaidya, D., Shah, M., Sircar, A. and Sahajpal, S., 2017, Space Heating and Cooling Application Based on Low Enthalpy Geothermal Reservoirs with a Focus on Indian Subcontinent, February, 2017, 42nd Geothermal Workshop, Stanford University, pp. 1- 6. 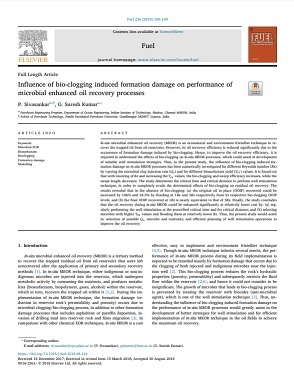 Akshit Patel, Dipesh Nihalani, Dhaivat Mankad, Dhaval Patel Ravi Chaudhari, Mehul Dhameliya, Dutt Tripathi, Uttam K. Bhui (2017), Evaluating Feasibility of Hydrophilic Silica Nanoparticles for In-Situ Emulsion Formation in Presence of Co-Surfactant: An Experimental Study. DOI https://doi.org/10.2118/188141-MS Document ID SPE-188141-MS Publisher Society of Petroleum Engineers Source SPE Kingdom of Saudi Arabia Annual Technical Symposium and Exhibition, 24-27 April, Dammam, Saudi Arabia. Uttam K. Bhui, Akshit Patel, Dhaval Patel, Dipesh Nihalani, Dhaivat Mankad, Mehul Dhameliya, Dutt Tripathi, Ravi Chaudhari and Saheli Sanyal (2017). 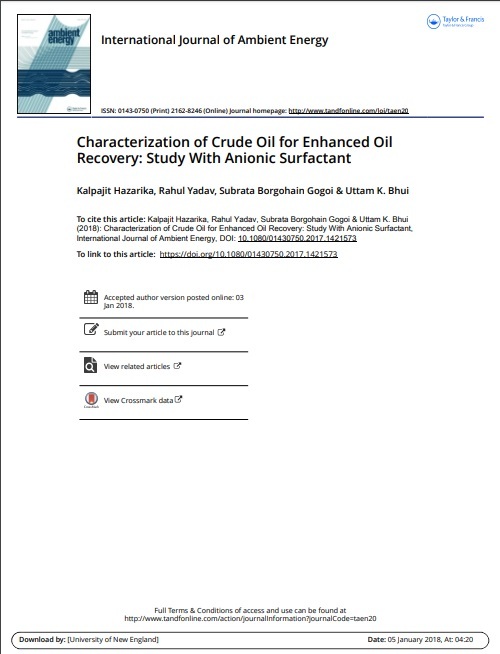 Feasibility Study of Silica Nanoparticles for Enhanced Oil Recovery: An Experimental Approach with Crude Oils from Cambay Basin Reservoirs‟. International Conference on Nano for Energy and Water (NEW)‟, Springer Proceedings in Energy (Accepted). Sahajpal, S. and Sircar, A., 2017, Improve Gas Distribution networks with innovative pipeline monitoring and network, Gas Processing, Jan-Feb-2017, pp. 23-26, Gulf Publishing. Talukdar, M., Sanyal, S. and Sengupta, P. 2017. Dufrénite crystallization in an Archaean BIF from the Mahadevi Layered Complex, Tamil Nadu, India. Goldschmidt 2017, Paris, France. (Poster presentation). 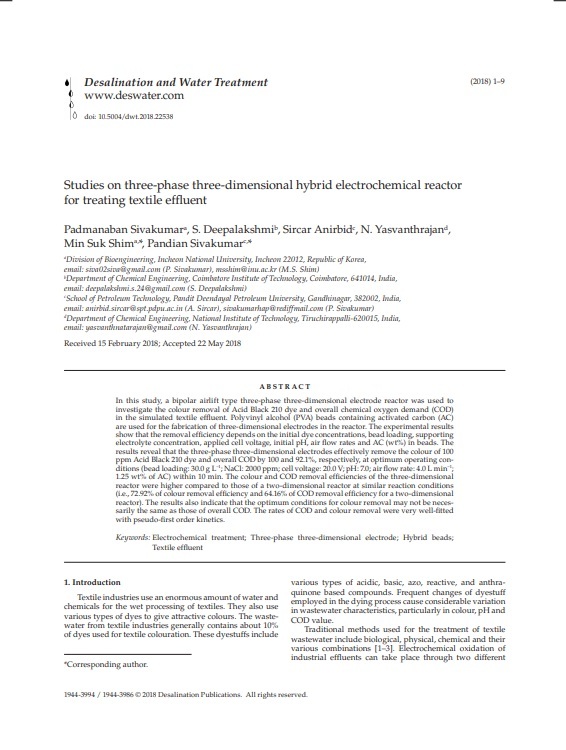 Desai, B. (2016) Ichnological Analysis of the Pleistocene Dwarka Formation, Gulf of Kachchh: Tracemaker Behaviors and Reworked Traces. GeodinamicaActa, Taylor & Francis, Vol. 28(2); 18-33. 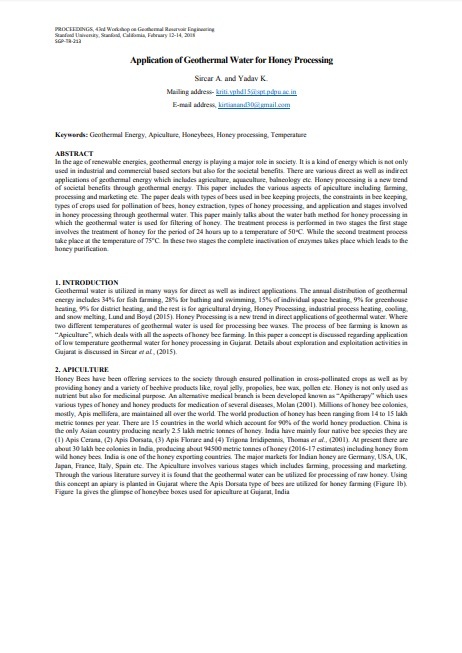 Shubra, D., Sircar, A., Shah, M., Vaidya, D., Choudhary, A., Sahajpal, S. and Yadav, K., 2016, “Space Heating and Cooling using Geothermal Energy”, DEW Journal, March, 2016, pp. 37-41. 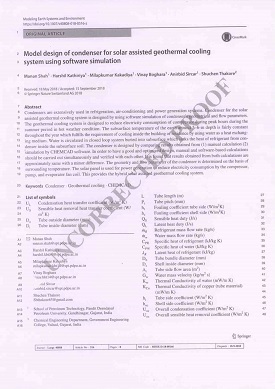 Sircar, A., Yadav K., Shah, M., Sahajpal S., Chinan R. (2016). 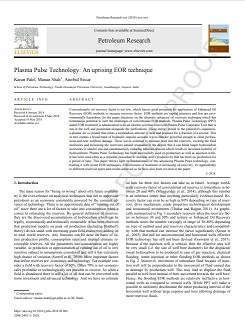 Seismic Imaging for Geothermal Exploration: A Case study from Dholera, India. International Advance Research Journal in Science, Engineering and Technology, Vol. 3, Issue (7); 219-230. Sircar, A. and Sharma, V., 2016, “Structural identification and fracture characterization of North Cambay shale, Cambay Basin, Gujarat by using Image Log” , Accepted in DEW Journal. 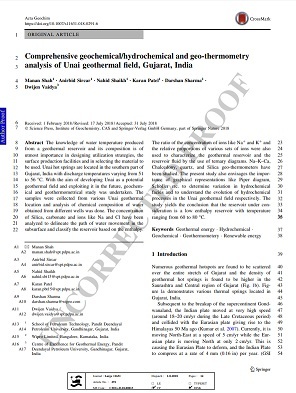 Sircar A., Shah M., and Sharma S., “Selection of Working Fluid for Organic Rankine Cycle by Energy and Energy, For Low Temperature Low Enthalpy Dholera Geothermal Reservoir”, 2016 (Accepted for Publication in Emerging Trends in Chemical). Sarkar, A. and Ogle, N. (2015). Late Quaternary climatic record from ODP Site 705 in the Northern Indian Ocean. Procedia Earth and Planetary Science. V. 13, pp. 138 – 141. Sarkar, S. and Sarkar, A. (2015). Stable carbon and oxygen isotopes in red boles: A clue to understand its formation mechanism. Procedia Earth and Planetary Science. V. 13, pp. 80 – 83. Sircar, A., Sahajpal, S. and Yadav, K., (2016), A review on organic rankine cycle : Application to geothermal energy, Dew Journal, pp. 57-63. 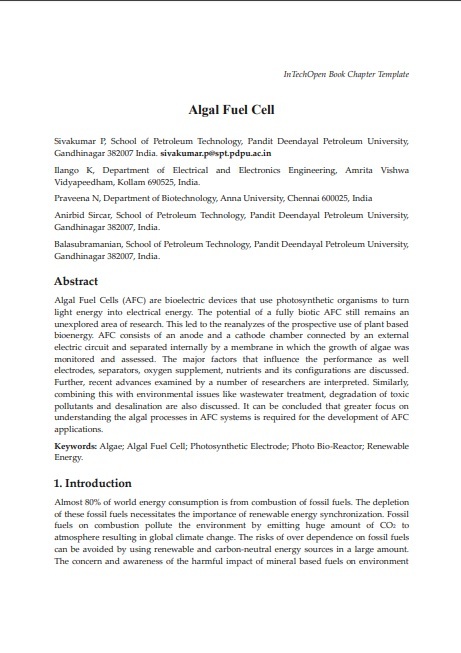 Vaidya, D., Shah, M., Sircar, A., Sahajpal, S., Dhale, S. (2015), Geothermal Energy: Exploration Efforts In India, International Journal of Latest Research in Science and Technology, Volume 4, Issue 4, July-August 2015, ISSN:2278-5299, 61-69. Gupta, A. and Sircar, A. (2015), Flow Assurance and Comparison of Modeling for Onshore Crude Oil Trunk Line Using SCADA Results, International Journal of Latest Technology in Engineering, Management & Applied Science (IJLTEMAS), Vol. 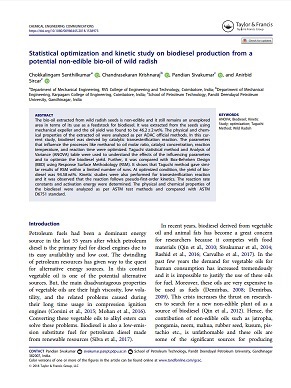 IV, Issue VI, July 2015, ISSN 2278-2540, Impact Factor: 2.115, 52-60. Sahajpal, S., Sircar, A., Singh, A., Vaidya, D., Shah, M., Dhale, S., (2015), Geothermal Exploration in Gujarat: Case Study from Unai, International Journal of Latest Technology in Engineering, Management & Applied Science (IJLTEMAS), Vol. IV, Issue V, June 2015, ISSN 2278-2540, Impact Factor: 2.115, 38-49. Desai, B. G., & Saklani, R. D., (2015), Palaeocommunity Dynamics and Behavioral Analysis of Conichnus: Bhuj Formation (Lower Cretaceous), Kachchh-India, Ichnos: An International Journal for Plant and Animal Traces, 22:1, 43-55, DOI: 10.1080/10420940.2014.995377. 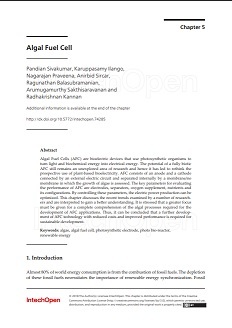 Ariketi, R., Behera, B. K., Bhui, U. K., (2015), Shale Gas in India: Opportunities & Challenges, International Journal of Scientific Research, Vol. 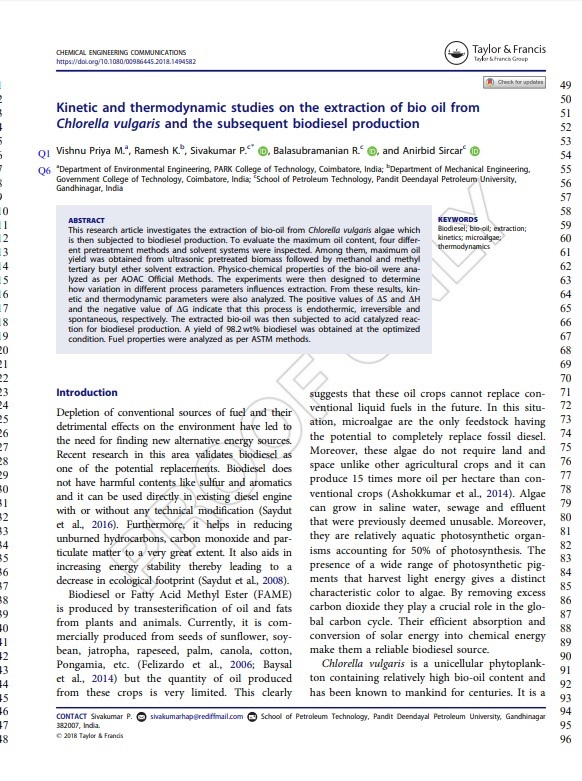 4, Issue 3, ISSN 2277-8179, DOI: 10.15373/22778179, 320-325. Gupta, A. and Sircar, A. 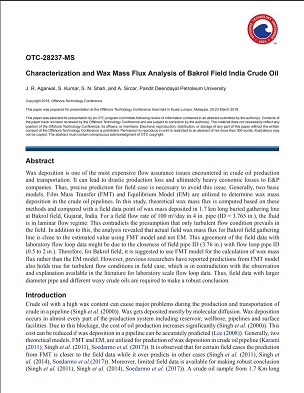 (2015) Need of Flow Assurance for Crude Oil Pipelines: A Review. International Journal of Multidisciplinary Science and Engg, Vol 6, Issue2, Feb 2015, ISSN: 2045-7057, 43-49 Impact Factor: 0.46. 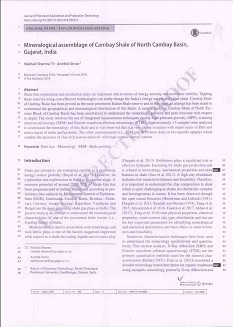 Sircar, A., Shah, M., Sahajpal, S., Vaidya, D., Dhale, S., Chaudhary, A., (2015), Geothermal Exploration in Gujarat: Case Study from Dholera, Geothermal Energy, Springer (under Review). Vaidya, D., Shah, M., Sircar, A., Sahajpal, S., Dhale, S., Chaudhary, A., (2015), Geothermal Energy: Exploration Efforts in India, International Journal of Latest Research in Science and Technology (under Review). Jain, S and Desai, B. G. (2014), Biochronostratigraphic Implications of the Discovery of Late Bathonian Indonesian Ammonite Macrocephalites Cf. Mantataranus Boehm [M] from the Core of Jara Dome, Kachchh, Western India, Journal of Paleontological Society of Indi, 59(2), 169-180. Desai, B. G. and Saklani, R. D. (2014), Ichnofabric Analysis of the Tithonian Shallow Marine Sediments (Bhadasar Formation) Jaisalmer Basin, India, Journal of Earth System Science, 123(6), 1413-1431. Singh Anil and Sircar A, (2014), Sources and Measurement of Velocity Anisotropy of Cambay Shale, Cambay Basin, India, International Journal of Latest Technology in Engineering, Management & Applied Science (IJLTEMAS),Volume III, Issue V, 169-179. 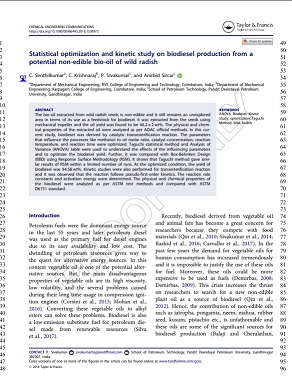 Thander, B., Sircar, A., and Karmakar, G. P., (2014), Hydrocarbon Resource Estimation: A Stochastic Approach, Journal of Exploration and Production Technology, Springer, DOI: 10.1007/s13202-014-0144-8. Sircar, A. and Brahma, J. (2013), Estimation of Thompsen’s Parameters in Western and Central Part of Tripura, India, Progress in Science and Engineering Research Journal, 10, Issue November-December, 17-27. Desai, B.G., (2013), Ichnological Analysis of Transgressive Marine Tongue in Prograding Deltaic System: Evidences from Ukra Hill Member, Western Kachchh, India, Journal of Geological Society of India, 83, 143-152. Brahma, J., Sircar, A. and Karmakar G. P., (2013), Hydrocarbon Prospectivity in Central Part of Tripura, India, Using an Integrated Approach, Journal of Geography and Geology, Canadian Center of Science and Education, Canada, Vol. 5, No.3, 116-134. 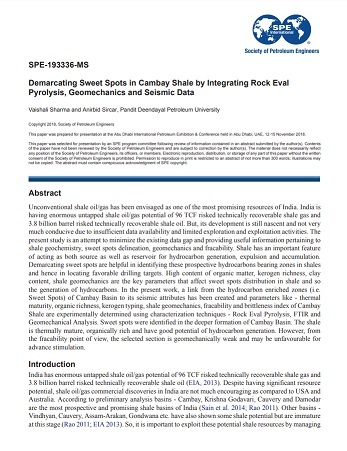 Devi, K.L., Sircar, A. and Karmakar, G.P., (2012), Hydrocarbon Potential Evaluation of Lower Cambay Shale and Olpad Formation in Cambay Basin, India: A Review, International Journal Of Geology, Earth and Environmental Sciences, 2 (3), 137-146. Sarkar, A., (2011), Bearing on Last Glacial Maxima (LGM) on Sediment Accumulation in Parts of Arabian Sea, Journal of Geological Society of India, 11, 98-99. Dutta, U., Bhui, U.K., Sengupta, P., Sanyal, S. and Mukhopadhyay, D., (2011), Magmatic and Metamorphic Imprints in 2.9 Ga Old Chromitites from the Sittampundi Layered Complex, Tamil Nadu, India, Ore Geology Review , 40: 90-107. Madhavan, N., (2011), An Update on Recent Natural and Manmade Disasters In Japan, Asian Journal of Water Environment And Pollution, 8(3): 95-105. Bhonde, U.A. 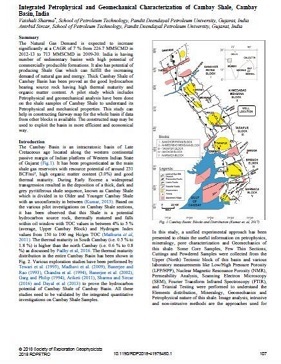 and Desai, B.G., (2011), Discontunity Surface and Event Stratigraphy of Okha Shell Limestone Member: Implications for Holocene Sea Level Changes, Western India, Journal of Earth System Sciences, 120(4): 723-734. 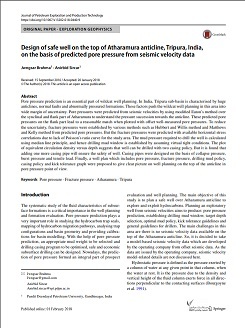 S. Babu and A. Sircar, (2011), Predicted Pore Pressures in Atharamura Matches with Drilled Well Pore Pressures in Tripura, India, Journal of Petroleum and Alternate fuel, Vol.2(9), 150-160. 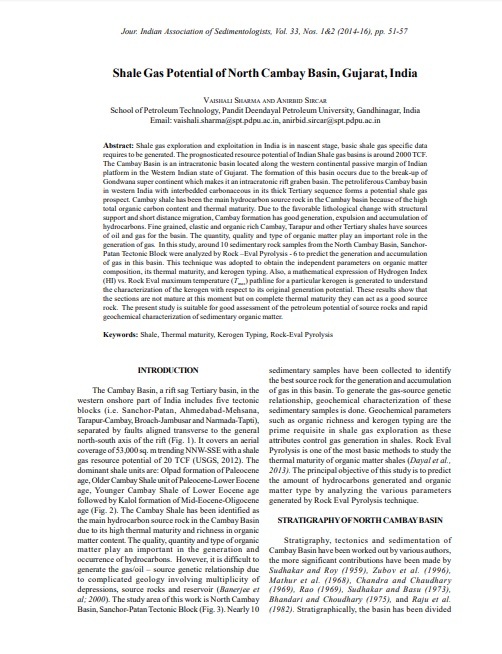 H. Patel, A. Sircar, S. Seth, R. Jadwani, (2011), Application of Genetic Algorithm in Hydrocarbon Resource Estimation, Journal of Petroleum Gas and Engineering, Vol.2(4), 83-92. 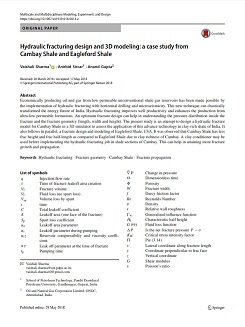 Sengupta, P., Dutta, U., Bhui, U.K. and Mukhopadhyay, D., (2009), Genesis of Wollastonite and Grandite- Rich Skarns in a Suite of Marble-Calc-Silicate Rocks from Sittampundi, Tamil Nadu: Constraints on the P-T-fluid Regime in Parts of the Pan-African Mobile Belt of South India, Mineralogy and Petrology, 95: 179-200. Sengupta, P., Bhui, U.K., Braun, I., Dutta, U. and Mukhopadhyay, D., (2009), Chemical Substitutions and Physical Conditions of Formation of Högbomite in the Sittampundi Layered Anorthosite Complex, South India, American Mineralogist, 94: 1520-1534. Patel, S.J., Desai, B.G. and Shukla, R., (2009), Paleoecological Significance of the Trace Fossils of DhosaOolite Member (Jumara formation), Jhura Dome, Mainland Kachchh, Western India, Journal Geological Society of India, 74: 601-614. Patel, S.J. and Desai, B.G., (2009), Animal-Sediment Relationship of the Crustaceans and Polychaetes in the Intertidal Zone Around Mandvi, Gulf of Kachchh, Western India, Journal of Geological Society of India, 74: 233-259. Das, K., Yokoyama, K., Chakraborty, P. P. and Sarkar, A., (2009), Basal Tuffs and Contemporaneity of the Chattisgarh and Khariar Basins Based on New Dates and Geochemistry, Journal of Geology, 117(1): 88-102. Chakraborty, P. P., Sarkar, A., Das, K. and Das, P., (2009), Alluvial Fan to Storm-Dominated Shelf Transition in the Mesoproterozoic Singhora Group, Chattisgarh Supergroup, Central India, Precambrian Research., 170(1-2): 88-106. Patel, S.J., Desai, B.G.,Vaidya, A. and Shukla, R., (2008), Middle Jurassic Trace Fossils from Habo Dome, Mainland Kachchh, Western India, Journal of Geological Society of India, 71: 345-362.